Quick Weight Loss Fasting Will Burn the Fat In a Hurry: One-to-Three Pounds Daily With a Water Fast and Three-to-Five Pounds Weekly While Juicing Or Following Other Liquid Fasting Detox Diets. Fasting can put you on the pathway to quick weight loss like nothing else on the face of this earth. If you are more than 50 pounds overweight, then I strongly encourage you to consider fasting as a means of ridding your body of dangerous pounds fast. I would implore you to set aside everything else going on in your life and take immediate stock of whether fasting is for you or not. And it doesn't have to be a very long fast either. In just 14 days of water fasting, it is possible to experience quick weight loss of 20 to as much as 30 - even 40 pounds. But even if you are only 10-to-20 pounds overweight, fasting can help you to lose weight fast and furious. Fasting for as little as SEVEN days can take as many as TWENTY pounds off your body, thus reducing the risk of chronic disease. 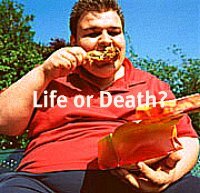 Then you can work at staying free of junk and adopting permanent eating-habit changes. The equation I am presenting is simple and to-the-point: Get rid of excess weight quickly through fasting, THEN make a commitment that you will larn to eat in healthy rather than destructive ways. In my opinion, there is nothing more powerful than fasting to lose weight fast and improve physical, mental and spiritual health. All you have to do is MAKE UP YOUR MIND and take action. If you have tried many diets and failed, it is likely that your body needs some time WITHOUT food so it can heal. It's like the cigarette smoker. As long as this person keeps smoking, he or she will never be free of the addiction, right? Well, sometimes it is like that with food. If you have eaten poorly for a long time, your body is in many ways "addicted" and needs to withdraw and cleanse. Water and juice fasting are powerful ways to achieve body detox cleansing and quick weight loss. And, as a bonus, you get to lose massive amounts of weight in a short period of time. What other motivation could you possibly need? Look, it's about giving your digestive system time to rest. When you work a long week ... are you tired? Do you want to work the weekend also? Or do you want to rest? Click here to watch Appetite Suppression & Weight Loss Hypnosis Video - Chaper 2. *The first 7 days of water fasting one can expect to lose anywhere between 10 to 30 pounds. I've heard of people who have lost as much as 50 pounds in seven days of water fasting. These numbers, however, are not the norm. One-to-two pounds daily is much more common. Furthermore, a lot of those pounds are initially water weight, meaning that it may take a bit longer to get rid of solid fat deposits. Still, to see all of that weight come off the body so quickly is truly a tremendous experience; it provides motivation to keep going. During those first seven days of quick weight loss fasting, your body will dump bloating liquid accumulations in your skin, especially if your diet included substantial amounts of salt. On days three and four, the massive fat burning continues as the body enters ketosis. After seven days, water fasting produces ongoing Natural Weight Loss of approximately one-to-two-pounds per day. In other words, after your body completes the initial heavy detox, usually in nine-to-eleven days, the weight loss will slow to one-to-two pounds daily. One pound per day is by far the most common, based on my experience. When I did a 60-day water fast some years ago, I lost a massive 65 pounds. My results substantiate the 'one-pound-per-day' average. Some, however, continue to experience accelerated weight loss all the way through. My friend Jim, for example, did a 60-day water fast a few years ago and lost a whopping 100 pounds. The only way for you to know how much weight your body will lose through fasting, is to jump on the bandwagon and try it for yourself. *With juice fasting, one will usually lose three-to-five pounds per week as an average. I completed a 100-day juice fast and lost 60 pounds. A lady that I coached a few years ago, on the other hand, finished a 60-day juice fast and walked away grinning - 90 pounds lighter. In a very unusual case, an obese man that I met at the gym last year was inspired by my fasting testimony and juiced for 45 days. Believe it or not, he lost 115 pounds! That is by far the most dramatic example of quick weight loss through fasting that I have seen in recent times. These figures, as I said, are averages: your weight loss may be greater or slightly-lesser, depending on body-chemistry. Now tell me, honestly: WHERE ELSE CAN ONE ATTAIN THESE TYPES OF QUICK WEIGHT LOSS NUMBERS? 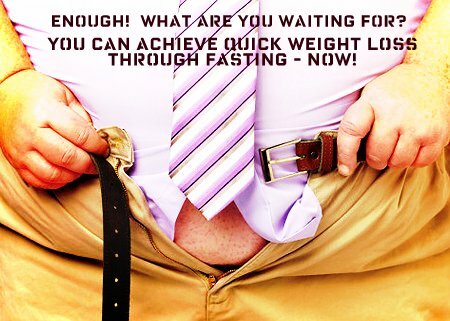 I would venture to say that NOTHING can help a person remove dangerous pounds as quickly and as efficiently as fasting. A good technique to maximize quick weight loss while fasting is to include some "light exercise" daily for at least half-an-hour. When I say light, I MEAN light. Something like walking, swimming or slow, long-distance bike riding would be good. Stretching is great while fasting because it releases toxins trapped throughout the body and thus facilitates weight loss and expedites the cleansing process. If you are into weight training, keep the weight lower than you usually would to reduce exertion. The exercise should be comfortable and easy. DO NOT have a hard workout while you are fasting. That can cause fainting and is dangerous. A nice 30-minute stroll, swim of light weight training routine will more than suffice. If you are fasting for more than seven days, pay attention to your daily quick weight loss numbers before adding the light workout. Like I said, the average is one-to-two pounds daily. Determine whether you fall into the "one-pound" or "two-pound" per-day category. There are a fortunate few who lose as much as three pounds daily, but one and two pounds is the most common figure. Weigh yourself ONCE A WEEK while fasting to see what your quick weight loss looks like. Divide the amount of weight you lost by seven to see how many pounds per-day you are losing. Then add the 30-minute stroll or swim for the following seven days and weigh yourself again. Divide the weight you lost by seven. You will be very pleasantly surprised to see that you will have lost as much as five pounds more that week than you did when you fasted WITHOUT exercise. Again, the key is LIGHT EXERCISE. The best way to approach quick weight loss fasting is to do it SLOW AND STEADY. Let your body burn the fat at its own pace. I can write an entire journal about the quick weight loss benefits of fasting, but none of it would add up to much unless YOU make the decision to try it for yourself. You can do nothing and continue to talk and lament about needing to lose weight, or you can take action and start seeing results. As you know, many things in life require sacrifice and discomfort. I can't think of anything more worthy of this than YOUR OWN HEALTH! Don't let your mind trap you into thinking that "nothing will work, that you will never make it; that you are not good enough to lose weight and improve your health". Those are all but lies and distortions based on fear. Based on a twisted perception of reality which says that somehow being overweight means that I am weak or "less than" others. Please do not allow such trash to determine your path in life. You DO have the power. You have the power of DECISION, right here, right now to determine that YES - you ARE going to give it your all. You are NOT going to stop until you lose every last ounce of excess weight off of your body and reclaim the optimum health that is rightfully yours! There are no "fix-all" pills, diets or cures. Sorry... they just don't exist. What we DO have is the ability to make a firm commitment with ourselves about the quality of lives we wish to lead. It has to come to the point where being lean, healthy and free of junk food becomes more pleasurable and desireable than sticking that cheeseburger or pizza in our mouths. There is a saying that a colleague uses that I like a lot: NOTHING TASTES AS GOOD AS THIN FEELS. God bless you! Contact Me if I can be of help! Now let's continue with an article that talks about Seeing Beyond Ourselves as a mindset that can motivate you to lose weight once and for all. Return from Quick Weight Loss Fasting to HOME.